Canberra rockers Hands Like Houses are thrilled to announce a national album tour in February, unleashing their latest full-length -Anon. 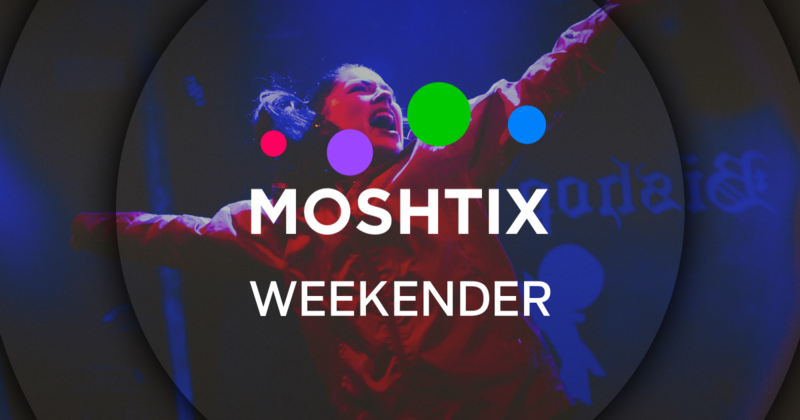 live to the masses, joined by special guests Ocean Grove. 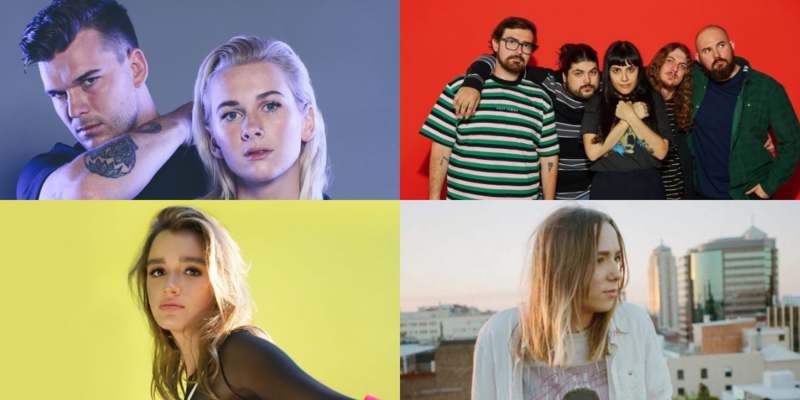 Making its ARIA debut this week at #4, the acclaimed record, featuring massive singles 'Monster' and 'Overthinking', was awarded the highly coveted triple j Feature Album, and was supported by a string of album release shows that sold out within a week. Tickets on sale 9am 25 October via handslikehouses.net. -Anon. is available to purchase here. To celebrate the release of -Anon. 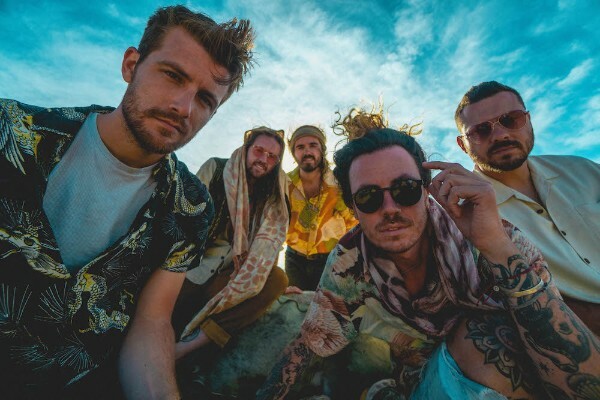 Hands Like Houses will launch the LP with a six-date national tour next year, bringing their electric energy and commanding, masterful performance-style around the country. Following three back-to-back sold out Australian tours, the band returns for their largest headline shows to date, kicking off in their hometown Canberra, before making their way to Sydney, Brisbane, Melbourne, Adelaide and finishing in Perth. The tour will come off the back of an extensive international run of 40 dates across the UK, Europe and US to close out 2018. 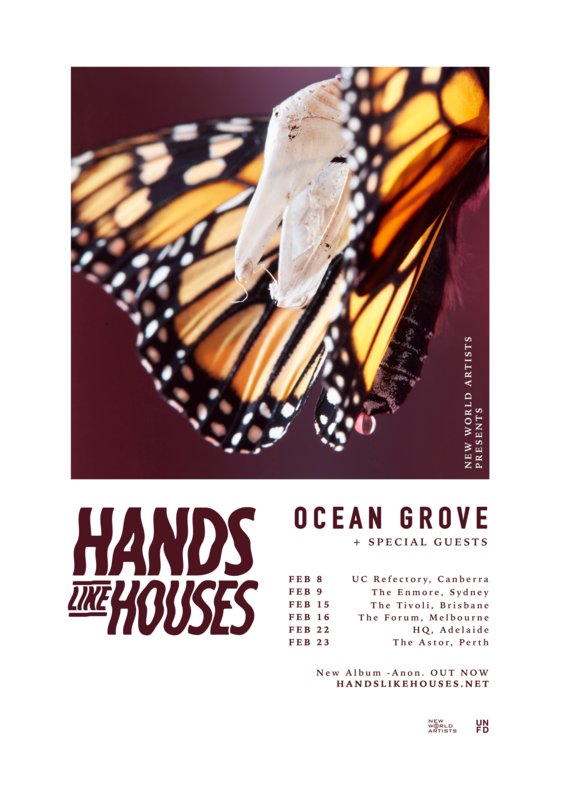 Joining the tour as main support on all dates are Melbourne's Ocean Grove, fresh from an extended writing stint, to play their first Australian shows since supporting Limp Bizkit back in March. 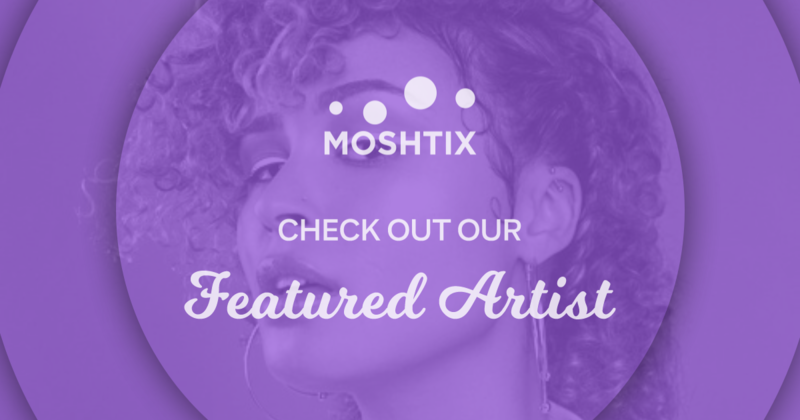 Their critically acclaimed, genre-bending debut The Rhapsody Tapes was released in 2017 and saw the quintet sell-out headline shows across their home country, while giving audiences abroad their first foray into the oddworld. On their fourth album, Hands Like Houses' sound is further built upon catchy hooks and exhilarating guitar work injected with a modern rock'n'roll sensibility - songs like 'Tilt' and 'Bad Dream' easy to imagine roaring through a stadium. Their sonic progression on -Anon. has received widespread praise, including Kerrang! calling the album "a bold step into the unknown... their play for the big leagues" andAltMedia declaring "the evolution of Hands Like Houses is certainly something special" in a 4.5 star review. The bolstering track 'Monster' was picked up as the WWE Super Show-Down official theme song, broadcast to over 70,000 wrestling fans at the MCG, and is also currently running in a major sync on FOX8 for the network's DC universe. Hailing from Canberra, five-piece Hands Like Houses - Trenton Woodley (vocals), Alexander Pearson (guitar), Joel Tyrrell (bass), Matt Cooper (guitar), Matthew Parkitny (drums) - have spent the past decade thrilling audiences with their dynamic performances, sharing arena stages with heavyweights such asBring Me The Horizon and A Day To Remember at home, to performing internationally alongside legendary acts including Red Hot Chili Peppers, Alice Cooper and Disturbed on Download Festivaland Rock on the Range to name a few. With four albums under their belt, including two critically acclaimed Top 10 ARIA records, -Anon. which debuted at #4 and 2016's Dissonants at #7, the band have sold over 100,000 records worldwide and amassed over 93 million Spotify streams.